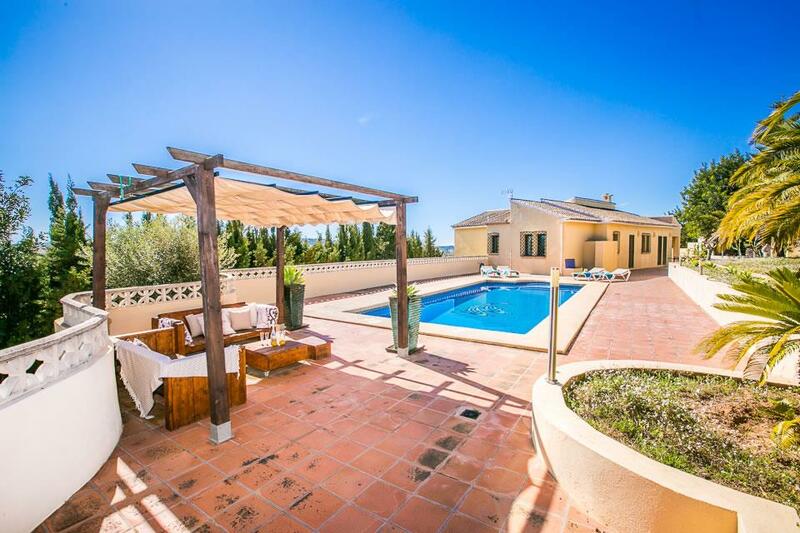 Unhurried tranquility in this superb, classically styled villa situated in the valley behind Moraira, close to the traditional town of Benissa. Large private grounds offer a great degree of privacy and the surrounding countryside a stunning backdrop. Well furnished and spacious, key features include air conditioning, WiFi internet, satellite television channels, an outdoor kitchen and table tennis. Villa Berdica is something special. 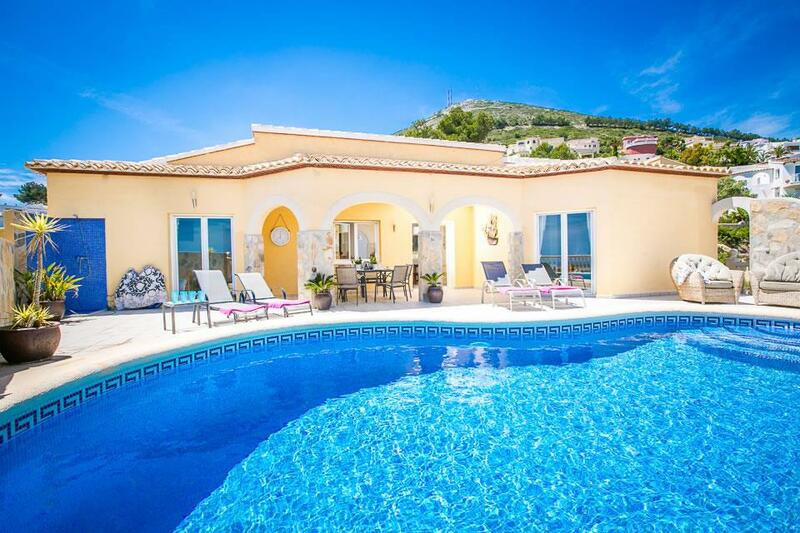 Set in large private grounds on the outskirts of the town of Benissa, just a short drive from the main resort of Moraira and it's wide choice of amenities and sandy beaches. It boasts outdoor terraces almost as large as the internal floor-space of the villa, fantastic in the summer months. The much larger than average private pool measures 4.5 m x 10.5 m and is surrounded by an expanse of terrace with comfortable furniture. Ample private parking is available as well as a garage to the front of the property and a traditional outdoor kitchen with barbecue. The internal accommodation includes two separate apartments, the upper apartment with two bedrooms (one double and one with twin singles) as well as lounge, kitchen and terraces. The lower apartment features a second smaller lounge and bedroom with twin beds. 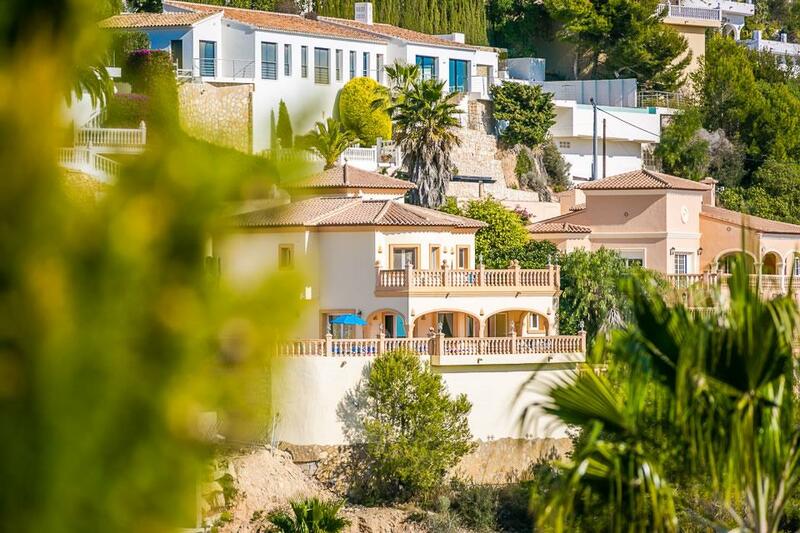 In summary the key features are a beautiful country setting, close to the amenities, spacious grounds with large terraces, stunning open views and outdoor features that include an outdoor kitchen, table tennis, a super-size private pool and even a garage if required. Internally, the accommodation is spacious and furnishings are of excellent quality, the kitchen and bathrooms are excellent and there is the benefit of air conditioning, WiFi and satellite television channels. Highly recommended. 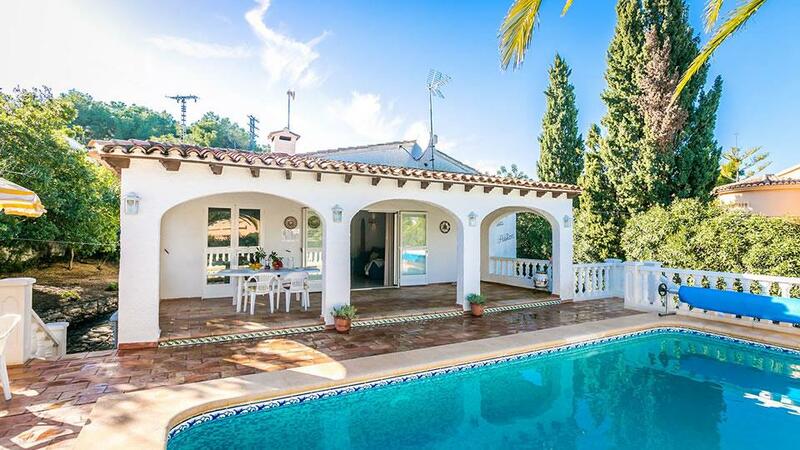 The villa is accessed via a large sweeping driveway surrounded by established shrubbery and surrounding countryside. This leads onto a large private parking area that includes access to the garage if required. The front door leads from a shaded porch area into an impressive, spacious, beautifully furnished lounge-dining room that benefits from panoramic views of the valleys and mountains. Comfortable sofas, LED television with a choice of some UK satellite channels and WiFi broadband are provided. The comfortable dining table is adjacent to the sofas and comfortably seat six guests, offering similar views across the valley. Two sets of patio doors from the living area lead into a naya that has arched windows and a central set of patio doors leading out onto a balcony that spans the length of the villa. This area offers further comfortable dining table and a further sofa area. The modern kitchen is of a good size with marble work tops and integrated appliances that include a dishwasher, electric hob and oven. There is a fridge-freezer and also a microwave. Patio doors from the living area and a door from the kitchen lead out onto a very quaint patio area that is surrounded on all four sides by walls and features a small water fountain. An ideal space from which to escape the sun. The good sized master bedroom has a super king size bed that is equivalent to two 3ft single beds, it benefits from air conditioning, built in wardrobes and comfortable furnishings. It also benefits from a large en-suite bathroom with marble topped vanity unit and inbuilt sink, toilet and whirpool style corner bath. The second upper floor bedroom has twin single beds, it is also air conditioned with built in wardrobes and has use of its own family bathroom which again features marble topped vanity unit and inbuilt sink, toilet and good sized shower cubicle. (This bathroom also houses the washing machine). The private pool and main terraces are also on this upper level to the side of the villa, accessible from the kitchen, front entrance and hallway. There is a table tennis and large terraces surround a much larger than average private pool measuring 10.5 m x 4.5 m with roman steps to the shallow end. There are several sunbeds and at the end of the pool terrace a wonderful shaded gazebo with with seating and table. A little further on at the end of the garden is a traditional outdoor shaded BBQ kitchen with sink, worktops and barbecue. Wonderful open country views can be enjoyed from most of the outdoor terraces. The lower floor apartment (separate external entrance) features a second small living area with dining table and a bedroom with twin single beds, built in wardrobes and air conditioning. The bathroom features a vanity unit with marble top and sink and a toilet. The gardens are worth special not and feature a huge variety of mature shrubs, trees and cacti. The town of Benissa is within less than 15 minutes walk or a short drive and offers a wide choice of supermarkets and some interesting local restaurants and bars. 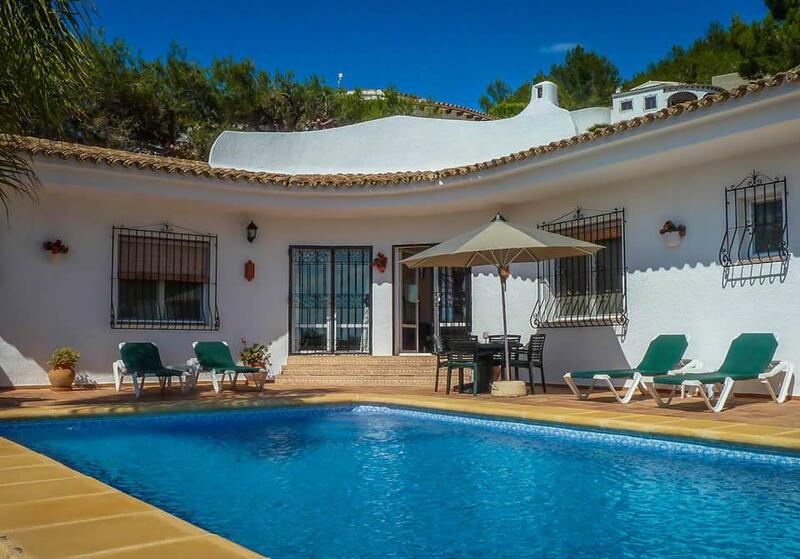 The key resort of Moraira and its huge choice of amenities and sandy beaches is less than 15 minutes drive away.